While former Haryana Inspector-General of Police MS Ahlawat, accused of molesting a lawyer, continued to be elusive, the victim advocate today accused former Chief Minister Om Prakash Chautala of shielding the officer. The Neem Khera panchayat in Mewat which shot to fame for being the only all-women panchayat of the region last elections, has renewed its efforts to retain its “celebrity tag” this term too. The Haryana government today appointed Justice Iqbal Singh, a retired judge of the Punjab and Haryana High Court, as the one-man commission of inquiry to look into the Mirchpur incident and submit a report within three months. While the commoners are facing a shortage of potable water, the water mafia, allegedly in league with a section of the law-enforcing agencies, has translated the people’s misery into a commercial venture for itself. Twenty years after Haryana State Federation of Consumers’ Cooperative Wholesale Stores Limited (Confed) retrenche “surplus employees”, the Punjab and Haryana High Court has asked the state government to decide as per policy their plea for “adjustment” in other departments. Irked over the erratic power supply in their area, villagers from Jiwan Nagar, Sant Nagar, Haripura, Ramsinghpura, Bharolanwali, Santawali and Nakoda blocked traffic on the Sirsa-Ellenabad state highway near the 33 kV substation at Jiwan Nagar today. Haryana today became the first state in the country to launch a web portal-based centralised public grievances redress and monitoring system known as “Harsamadhan” to provide a quick grievance redressal mechanism to empower residents. Alarmed at the rise in the number of incidents related to disputes between various communities and castes, the district administration has announced to set up special committees at the subdivisional level to take steps to check such incidents. Pot-bellied cops in the state have been asked to shed weight and ensure physical fitness so as to look presentable. Unkempt hair would have to be cut short and neatly combed. These are the directions of Director-General of Police RS Dalal to his SPs and IGs. At least six persons, including four of a family, were killed and four others received serious injuries when a government ambulance they were travelling in collided head-on with a private school bus on the Jahajgarh-Beri road near Jahajgarh village here late last night. The injured have been admitted to the PGIMS, Rohtak, where the condition of two of them is stated to be critical. A CBI team from Dehradun today raided a place in Sector 21 here and arrested a person named Sahid Zaidi in connection with unaccounted international telephone calls, allegedly in connivance with the personnel of the BSNL department. Hiding behind a veil, the Yamunanagar-based lawyer, staged a protest at the official residence of Chautala in Sector 19 and in Sector 2. Carrying placards on the injustice meted out to her, she said the officer was Chautala’s "blue-eyed boy". She maintained that she had represented to Chautala and other senior officers of his government on being “victimised” but no action was initiated against the officer. Yamunanagar: Even after three days of rejection of his anticipatory bail plea, the former IG, MS Ahlawat, booked on molestation charges, remains untraced. The police teams sent to possible hideouts in Bhiwani, Gurgaon and Shahranpur in UP to arrest him could not find him there and returned this evening. Ahlawat is accused of molesting city resident Arvinder Kaur and threatening her with defamation while posted as SP Yamunanagar in 2002. The case against Ahlawat was registered under Sections 323, 354 and 506 of the IPC in the city police Station,Yamunanagar, on June 8. The search for Ahlawat was launched after he failed to show up before the police, despite a notice sent to him. With elections out of the way and three men making it to the nine-member panchayat headed by Asubi Khan, who had earlier headed the all-women panchayat, efforts are now afoot to persuade the men step down. Talks between villagers led by the sarpanch are on with the Sorab Khan, Noor Mohammad and Sharif Ahmed to resign from their posts and make way for women power. The three men have been given the choice of naming a woman from their family for the post on the understanding that the village would unanimously support their candidature. “Their main fight was against me. Despite all efforts of a section of the villagers to have me voted out, the men contesting against me had to bite the dust. A handful of men were hopeful of wresting power and controlling the panchayat because a lot of funds came in during my term. “Our contention is that if the villagers had chosen either of the men in the fray instead of me, there was no problem. But now that I am the sarpanch and ours is a very backward area, we can set an example of empowering women by re-electing an all-women panchayat,” explains Asubi Khan. While other panchayats formed after the just concluded panchayat elections are busy with oath ceremonies, the Neem Khera panchayat is still to be sworn in. Informal meetings are being held in the hope that the three panches will finally agree to an all-women panchayat. He maintains that he has reconciled to women power and is even considering stepping down so that his wife can replace him. “There is no doubt that the all-women panchayat ushered in development during its last term. “We appreciate their work and effort but all three candidates have to be unanimous on the decision to step down. “ We are considering the offer and talks are on to see if such an option is feasible and in the interest of the village,” he maintains. If the talks fructify and the three panches do agree to step down from their position, they will submit their resignations to the DC after which the process of filling the posts will be initiated. For now, in Neem Khera, persuasion is the name of the game. Chief Minister Bhupinder Singh Hooda had recently announced a judicial inquiry into the Mirchpur incident by setting up a commission of inquiry. According to the notification issued today by Financial Commissioner and Principal Secretary Krishna Mohan, the appointment has been made in exercise of the powers conferred by sub-section (1) of section 3 of the Commissions of Inquiry Act 1952 (Central Act 60 of 1952). The commission has been asked to submit its report within three months. The commission will probe the circumstances leading to the death of two Dalits - Tara Chand and his daughter Suman, both residents of village Mirchpur, on April 21. Besides the death of the father-daughter duo in the incident, several other persons also sustained injuries due to arson, fire and rioting and houses of Dalits were damaged and set ablaze. It will also identify those responsible for the loss of life and property, violence and assess the damage caused to the houses of Dalits as well as to household items and consider the steps taken by the state government, including compensation, to the affected families. Sonepat: The police has registered a case on a complaint of some Dalits of Barona village under the Kharkhoda police station who alleged that some miscreants in the village damaged their houses. A DSP-rank officer has been deputed to probe the incident. However, no arrest has been made so far. According to SP Ashok Kumar, after receiving the complaint, DSP Randhir Singh reached the village for an on-the-spot inquiry and recorded the statements of the people concerned. The damaged houses and other construction work were also videographed. The SP said some Dalit families in the village were allotted 100 sq yd plots and many of them had done construction work on these. Some miscreants had damaged the construction. He said after the completion of the inquiry, action would be taken against the accused. The affected families have complained that the houses were damaged allegedly at the behest of the newly elected sarpanch of the village. Interestingly, the post of the sarpanch is reserved for the Scheduled Castes. Having a wide network, the water mafia allegedly draws water illegally from submersible pumps in various parts of Faridabad and sells it on the black market in this district as well as in areas falling on the Faridabad-Delhi border. Water is allegedly supplied to industrial units in these areas. Although the commercialisation of water by the mafia had been going on for the past many years, it has become rampant during the past few months. The issue was recently raised by Faridabad MP Avtar Singh Bhadana while presiding over a meeting of the district monitoring committee headed by him. The MP had submitted a note to the Deputy Commissioner detailing the illegal practice and it was decided that action would be taken wthin 15 days. The problem, however, has only aggravated. Hundreds of tankers are used by the water mafia to supply the illegally procured water. The modus operandi is that generally some local strongmen, who own the illegally bored pumps, supply water at Rs 60 to Rs 80 per tanker. The owners of tankers sell it to buyers at about Rs 400 per tanker. At the retail level, water is sold at Rs 20 to Rs 30 per bucket to consumers in colonies. Although the illegally bored pumps dot several parts of Faridabad, they are more visible on a 5-km stretch on the Sohna road near Kheri village. The retail business of water is flourishing in a large number of colonies and slums, especially in the NIT area. 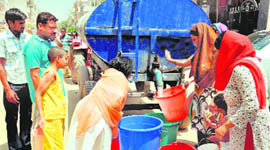 People are angry that the water from the district is being illegally sold in villages and industrial units in Delhi. According to Ram Singh of Dabua Colony, the water mafia would not have succeeded without the collusion of a section of the government machinery. Many feel that the water mafia is thriving as the Municipal Corporation Faridabad has failed to provide ample water to colonies. In some pockets of far-flung areas like Dabua Colony, Jawahar Colony, Sanjay Gandhi Nagar and Nangla Colony, the MCF has not been able to supply water at all. Also, the underground water in these areas is brackish, forcing people to buy water from the mafia. The directions by Justice Alok Singh came on a petition filed by Ramesh Kumar and other petitioners against the state of Haryana and other respondents. Available information suggests that over 600 employees were asked to pack their bags. Taking up the petition, Justice Alok Singh asserted: “The petitioners worked with Confed. It assessed the requirement of employees on March 31, 1989, with a view to improving the financial health of Confed. “A decision was taken on December 12, 1989, to assess the requirement of the staff and to retrench surplus employees/workmen as per the overall assessment. “It was decided to retrench the petitioners and pay them one month’s wages in lieu of a notice and also to pay retrenchment compensation equal to 15 days’ wages for each completed year of continuous service or a part thereof in excess of six months. “Ultimately vide impugned order dated February 27, 1990, the petitioners were retrenched and retrenchment compensation in lieu of the one-month notice period was also paid”. In his detailed order, Justice Alok Singh ruled: “The only grievance of the counsel for the petitioners is that the case of the petitioners as per the policy decision taken by Confed should have been referred to the re-employment cell of the government for their absorption and adjustment in other departments, which was not done…. “At this stage, the learned counsel for the petitioners states that an opportunity may be granted to the petitioners to make representation before the state government for their adjustment. “It goes without saying, if any representation is made, the same shall be decided as per the policy and in accordance with law,” the Bench ruled. “The power supply to our areas has been very poor for the past several days. We get power for hardly two to four hours in a day, leading to a lot of inconvenience,” alleged villager Karam Singh. He maintained that due to power scarcity, they had to fetch drinking water from long distances and water for their animals had become a luxury. Villagers said they had brought their problems to the notice of the authorities several times, but they got nothing except assurances. Efforts by executive magistrate MR Nehra and SHO Maha Singh failed to move the villagers, who insisted that senior officers of the power utilities should come and give some firm assurance. Finally, the villagers lifted the blockade after executive engineer RK Jain and his junior officers reached the blockade venue and assured the angry villagers that a schedule of their power supply would be given soon and they would start getting power for more hours in a day. Roads were also blocked near Santawali and Nakora village over the power scarcity today. Meanwhile, in Fatehabad district, villagers blocked road at Aherwan village near the district headquarters and Kulan near Tohana against the erratic supply of power. Villagers accused that the power problem in their village was more due to the corrupt attitude of some officials, who, they alleged, demanded money for releasing power to their area, than due to the actual scarcity. At Kulan, the villagers laid a siege on the main crossing today and it was lifted after three hours following authorities’ assurance. Launching the portal www. harsamadhan.gov.in as a pilot project of the Government of India, Haryana Chief Minister Bhupinder Singh Hooda said that redressal of residents’ grievances was the priority of the state government. He said the user-friendly new portal would help residents get their grievances redressed quickly. He hoped that “Harsamadhan” would prove a significant step forward in the field of e-governance in the state and would prove to be an important initiative to fulfil the government’s commitment to provide a people-friendly and transparent administration. 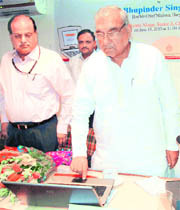 “Harsamadhan”would allow registration of grievances on an “anytime, anywhere” basis , Hooda said the government’s mission was to make governance transparent and enable online common solutions and feedback, reduce delivery costs by minimising duplication of effort by individuals and departments. Hooda thanked the Government of India for selecting Haryana for such a progressive step. He assured that all-out efforts would be made to make the web-based redressal system a success so that it could be replicated elsewhere. Secretary of the Department of Administrative Reforms and Public Grievances, Union Government, Ramesh C Misra said the state governments held the key to any transformational initiatives in governance and administration. “Mutual support is the way ahead for all of us and we will be more than happy to lend support to state governments’ initiatives and also keep learning from their best practices,” he said. Additional Principal Secretary to the Chief Minister and Director, Grievances, Shiv Raman Gaur said the complainants would be given a unique registration number online for lodging their grievances. He said the portal would be available in Hindi and English and many specifications had been added to make it people-friendly. Officers would be able to monitor the complaints and their redressal, he added. Dalal during his visit to different places in the state found even young recruits unusually fat and supporting long hair, looking shabby. In a letter to senior officials, the DGP said: “During my visit to Hisar, Hansi, Jind, stopping for while at Ismailabad, I came across many policemen who were not smartly dressed, their hair were overgrown and some of them were obnoxiously fat though fairly young in age”. “Every police official and jawan must have a personality that should make an impact on the public” the DGP further said. The DGP has directed the SPs, IG ( Hisar), IG (Gurgaon), IG (Faridabad), IG (Railways) and IG (Commandos) to find out such potbellied cops in their area and run fitness courses for them. According to information, Kiran had given birth to a child in the government hospital at Matanhel village last night, but she was referred to the PGIMS, Rohtak, for further treatment, when the newborn child did not respond after birth. The incident took place when Kiran was being taken to the PGIMS, Rohtak, in the ambulance having 10 persons on board. As the ambulance reached near Jahajgarh village, it collided with the bus coming from the opposite direction. Consequently, the ambulance overturned and three persons reportedly died on the spot while seven others received serious injuries. The bus driver fled from the spot leaving behind his vehicle. The Beri police rushed to the spot and took the injured to the PGIMS, Rohtak, where three others also succumbed to their injuries. Besides Kiran and her newborn child, the deceased have been identified as Kiran’s mother-in-law Shanti, and her nephew, Rahul, residents of Ladayan village here, and ambulance driver Rakesh Kumar and Surender Singh, residents of Matanhel village. Although the CBI team members remained tightlipped on the issue, it is learnt that the unaccounted calls caused loss to the tune of Rs 2 crore to the BSNL. A majority of the calls were made to Pakistan raising suspicion of the law enforcing agencies about the possible link with terrorism from across the border. The team today visited Faridabad producing warrant against the person residing in Sector 21.